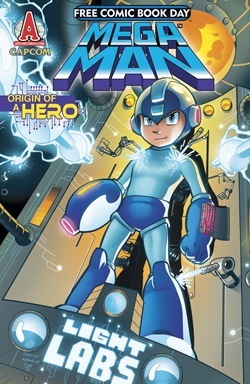 This year, Free Comic Book Day falls on May 5th, 2012, and Archie will be participating with a special edition of Mega Man issue #1: Let the Games Begin! The free issue sports an all-new colorized cover, featuring artwork by Chad Thomas. The prospect of a free issue allows new readers a chance to test the waters, all the while giving collectors another reason to repurchase issue #1. Smart move on Archie's part. What's particularly neat about all this is the bragging rights; out of hundreds if not thousands of comics, Mega Man #1 was chosen to represent FCBD, under the Gold sponsorship, no less. It's quite an honor to see Mega Man thrown into this honorable tradition, especially when you take a look at the other participating FCBD brand-name titles from Star Wars and Transformers, to The Simpsons and Peanuts. Our blue boy's in the big leagues now! Those interested, you can find a complete list of all FCBD comics in the January issue of Diamond Comic Distributors’ preview catalog, sold at all comic book shops on December 28. I am sure that I will be there to grab this free book and others. :P Good finding! "Our blue boy's in the big leagues now!" I snagged First Editions of the #1's while they were cheap. You better BELIEVE I'm snagging this one too. ...are there First/Premiere/Direct Editions of this sort of thing...?